Governor Kate Brown paid a visit to Central Oregon on Friday, February 1, and made her first stop of the day in Redmond where she met with a group of 18 teachers and school counselors representing school districts in Madras, Prineville, Redmond, Bend, and Sisters. Among the group were Sisters Elementary teacher Clay Warburton and Sisters Middle School teacher Deborah Riehle. 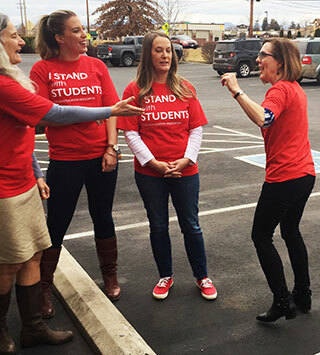 The Central Oregon office of Oregon Education Association helped organize the visit which was intended to allow the governor to hear directly from those "in the trenches" the needs of K-12 public education in the state. For an hour Brown listened and responded to teachers, some very experienced and others new to the field, who chronicled their experiences that have been impacted by the lack of funding in Oregon over the past 30 years, all the way back to Measure 5, that has seen Oregon's class sizes grow, school year length shrink, and graduation rates dip. Brown has made similar visits around the state as she put together her budget for the next two years. Her vision is for a seamless system of education from "cradle to career." "My goal is to figure out how to invest in the K-12 schools 9.1 billion this biennium," she said. "I know certainly we can do more than that which is why I have also created (an) investment package totalling two billion extra dollars focused on reducing class sizes for K-3 and extending the school year, as well as supporting Career Technical Ed (CTE)." Brown made mention of her previous visits to Bend and Sisters and complimented both as having "some extraordinary programs" in the CTE area. She quoted statistics that show the students who have access to CTE programs have a graduation rate as much as 10 percent higher than students who don't, which is attributed to the learning being more engaging and relevant. On this topic, one middle school teacher made the point that CTE needs to extend down into the lower grades as well as the improvements at the high school. Brown noted that the state has struggled since 1992, when she first ran for secretary of state, to stabilize funding for education. Measure 5, which passed in 1990, was followed by Measures 47 and 50 in 1996 and 1997, a decade marked by anti-tax fervor in the state. These measures, which cut property taxes, effectively took away local control for funding schools in Oregon and placed those decision in the hands of the legislature, which has resulted in over 25 years of funding erosion. She looks forward to the upcoming legislative session because she believes "it is an incredible opportunity to make a significant investment in our education system." Clay Warburton, long-time fourth-grade teacher at Sisters Elementary, sees a number of places that need further investment, but in no way wants anyone to misunderstand his gratitude for the local support from the Sisters community that sets our school district apart from most in the state. "One thing we heard repeatedly is that there is a critical need for more counselors and behavior programs K-12," he said. "This has really emerged as one of our greatest needs here in Sisters and throughout Central Oregon. The need for more care of our students, along with the dedication to teaching and learning was echoed by all of the educators who shared with the governor," he said. "As our colleagues from around the region described what was happening in their buildings, it became very apparent what a special scenario we have built here in Sisters...a scenario that is only being realized through the grants, generous families, local option bonds, and community partnerships that have supported and enhanced the many wonderful opportunities available to our students," he said. "I feel a deep sense of gratitude to be a part of such a dedicated and professional staff that gets to deliver learning experiences to our students within this framework of community support." Everyone in the group meeting, along with the governor, agreed that Oregon has gone too long underfunding education. People were not focused on increasing teacher salaries, but rather on improving learning and working conditions for everyone involved. A number of teachers spoke about the uphill battle of meeting the needs of their students when class sizes are large and support services including counselors, paraprofessionals, and behavioral specialists are inadequate. The governor has a strong belief in the payoff of high quality early childhood education, which means pre-kindergarten learning programs being installed throughout the state. "I want all of our low-income families to gain access to early childhood education over the next six years," she said. Behavioral health will also be funded more fully under her plan, with up to $50 million to be added, earmarked specifically for more early childhood access in that area. A student support specialist from La Pine spoke to the need for school districts to be more free to allocate funding tailored to that school or district's specific needs. "Fair is not always equal," she said. A rally of educators from throughout Oregon is scheduled for President's Day at 10 a.m. at the state capitol in Salem. The rally is part of a growing movement among educators and citizens working to increase educational funding in Oregon. A number of Sisters School District educators plan to attend. Following the meeting, Riehle said, "I appreciated how Governor Brown was listening and responding to the individual questions, and not being too broad in her responses. I think she realizes how difficult this job has become for school personnel, and also the importance of our students and our future. I hope she stands true to her ideas and can make some positive change."